As Brett Ewins' MP Steve Pound was getting rather swamped by people raising concerns about Brett's case following the report by Tony Wright, comic creator 'The Emperor' offered to act as a go-between and forward updates to concerned parties (via the 2000AD forum and websites covering British comics that can spread it further). I visited Brett in Wormwood Scrubs this morning and although it took some time for me to get used to his new heavily bearded appearance I was greatly relieved to find him in far better spirits than when we last spoke. He is receiving nearly all his medication and lacking only one particular tranquiliser but I’ll do what I can to sort this out. Brett now has his own cell and is producing a huge quantity of writing including work on his novel and many songs and poems. He has asked me to remind people that the Johnny Nemo collection will be published next year! We had a typically amazing Brett Ewins conversation for an hour and ranged over Buddhism in Thailand, adventures in Iceland, the art of Edward Lear, the “Black Freighter” pirate comics of the late 1950s/early 1960s, Henry Thoreau, standards of food available in Hanwell pubs and I almost missed the bombshell that Brett is engaged to marry a world famous singer/performer later this year. More details of Brett’s betrothed to follow! Brett is pinning his hopes on a bail hearing due within a fortnight and he is very hopeful that he will be allowed home then. His lyrical description of his longing to walk a country lane and look at the sky proved to me that Brett is not only one of the finest British artists of all time but a Writer of striking beauty and originality. He is working on a spy novel and I can’t wait to read it! People who know Brett well will be interested to hear that he now has a full luxuriant white beard but is very thin and still has to use his walking cane. He is currently reading all of Louis Theroux and his mind is as sharp as ever on detail. At one stage we were talking about Spike Milligan and I mentioned that he used to live in Orme Court off the Bayswater Road. Brett gave the exact address and told me that he used to write to Spike when he was a student at Drayton Manor ! Brett is smoking “to pass the time” and I was told that I could bring in a Postal Order for him to buy some tobacco but that it had to be made out to the Governor. When I arrived I was told that I had to post in the order – even though I was actually in the prison at the time! If anyone is planning to send anything I strongly suggest that you look at the Wormwood Scrubs website for details of what may and may not be sent. I am very grateful to “mighty emperor” for posting this information and sparing me having to write to the scores of Brett’s admirers who have contacted me. I’ve known Brett as a neighbour and a constituent for 25 years and I will continue to do all that I can to help at this time. The prisons minister, Crispin Blunt, is very much aware of the situation and the governor at the Scrubs has received many a message urging better treatment for Brett. The very considerable improvement in the medical treatment may well reflect these sources of pressure! I’ll try to update you on the bail hearing as soon as possible. This is the most encouraging report we've had on Brett's status to date. We wish him well and hope he is released soon. 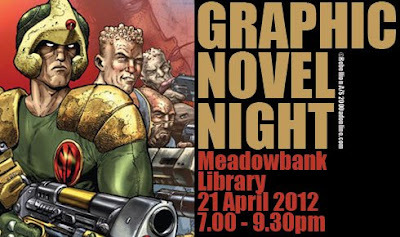 To tie-in with World Book Night, Meadowbank Library in Polmont near Falkirk will be holding a free Graphic Novel Night on Saturday 21 April 2012. Running from 1900 -2130 the event will bring together graphic novelists and artists to discuss their work and will also include a workshop on comics, small press publishers selling their novels, artists and writers signing sessions, an exhibition of art work and, as part of World Book Night, a free book giveaway. Creators currently scheduled to appear are David Bishop, Edinburgh based writer and former editor of 2000AD, writer John Chalmers and artist Sandra Marrs of Glasgow's Metaphrog who produce the Louis series of graphic novels, Ed Murphy of Glasgow publishers Rough Cut Comics who publish Rose Black and Demon Seed, and James Lundy of Armadale's small press Emancipation Studios whose current title is Wired. There are more details of the event on the Falkirk Community Trust website. There are more details of the venue on the Meadowbank Library website. 2000AD have announced that digital editions of its comics are now available within 48 hours of them hitting newsstands in the UK. In a major digital leap forward for the seminal British comic book, digital editions of 2000AD and its sister publication, the Judge Dredd Megazine, are now available worldwide in CBZ and PDF formats in the 2000AD store on the Friday after the print editions go on sale in the UK each Wednesday. This means that for the first time, readers will be able to read both titles digitally in the week they’re published. This is a substantial shift from the current format, which only sees them go online once they are superseded on the newsstands. 2000AD Prog 1776 and Judge Dredd Megazine 322 - featuring the talents of Andy Diggle, Leah Moore, John Reppion, Jock, Chris Weston, D’Israeli, John Wagner, Al Ewing, Henry Flint and many more - are the first editions to be available. Readers in North America also currently have to wait two weeks to get physical copies of both UK-printed titles, while those further afield have to wait longer. Computer games developer Rebellion, which owns 2000AD, has also announced that it is currently working on its own digital comics platform, due for release later this year. More details will follow in the coming weeks. “This is a big leap for us,” said Rebellion CEO Jason Kingsley. “We were one of the first publishers to produce digital copies of all our titles, though print editions were given priority. We felt this year, with 2000AD’s 35th birthday and the Dredd film coming out in September, was the time to take our digital strategy forward. Starting a month of shows all about British Comics, radio show Panel Borders' Alex Fitch interviews Richard Scholey, from design company The Chase, and Philip Parker, Head of Stamps strategy, Royal Mail, about the new range of comic book stamps which have just been released and feature art and covers from such classic titles as 2000AD, The Beano, The Eagle and The Dandy. Alex talks to Richard and Philip about their choice of covers, the design process and how the range of special stamps takes in high and low brow art throughout the year. With most Scottish comics fans decamping this weekend for the Hi-Ex comics convention in Inverness, the next major Scottish event in the comics calendar will be the manga, anime and games convention Dee-Con at the University of Dundee Students Union (DUSA) on Saturday 7 April 2012 with doors opening at Noon. This year's Dee-Con follows the previous three year's successful (and similarly named) D-Cons which grew from a single day with several hundred attendees in 2009 to two days and several thousand attendees in 2011. Dee-Con 2012 will have guest speakers with talks, art demonstrations and presentations covering various facets of anime and manga, video game tournaments including the brand new Street Fighter X Tekken, film screenings in their own private cinema room., as well as a Kendo demonstration from Northumbria University Kendo Club. In addition there will be an artist's alley/dealer's room with over 50 tables and a cosplay competition as well as a professional photo shoot for cosplayers. The day will end with an exclusive 18+ afterparty in DUSA with an audio and visual DJ set from 4MATT. All money raised will go towards funding the university's DJCAD Animation Programme's degree show activities. All the Dee-Con daytime activities are free and open to all while the 18+ evening afterparty will be £4 per person with tickets available on site throughout the day. 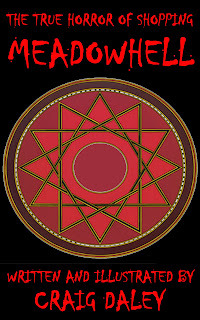 There are more details of Dee-Con 2012 on its website, blog and Facebook page. The latest issue of the Judge Dredd Megazine (322) is on sale now with an exclusive downloadable track from a brand new album by Portishead’s Geoff Barrow and Emmy-nominated composer Ben Salisbury. DROKK is the pair’s ‘soundtrack’ for Judge Dredd’s world, creating a soundscape befitting a nightmare 22nd Century megalopolis filled with criminals and crazies, and policed by authoritarian Judges. Readers can scan a QR code and exclusively download the first track from the album: Lawmaster/Pursuit.A founding member of Portishead, Barrow is the producer/owner of the Invada Records UK label and a lifelong 2000AD fan. Salisbury is a soundtrack composer with over 200 film and TV credits to his name, including three David Attenborough series. DROKK was born out of a meeting in late 2010 with a screenwriter to discuss possible work on a feature film project. Although their involvement in the film did not continue, they were encouraged by early demos.The issue also comes with an exclusive interview with Barrow about the album, his love of 2000 AD and the challenges of bringing Mega-City One to life with music. This issue, priced £5.60, includes the debut of Snapshot, a new creator-owned series by Andy Diggle and Jock, as well as the first work for the 2000AD stable by Leah Moore and John Reppion, who have penned a stand-alone Tales from the Black Museum story. It's the mask protesting about corruption and greed around the world, and its creator David Lloyd, the artist behind V for Vendetta, has just released an interactive graphic novel for the iPad addressing those very issues. "V for Vendetta was concerned with how a society becomes corrupt and how it frees itself from corruption," he says. "My graphic novel, Kickback, resonates with this theme, but it is about how one man frees himself from the shackles of his own corruption." 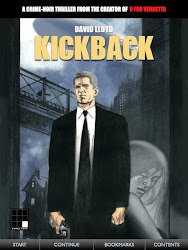 Kickback follows the story of Joe Canelli, a corrupt cop in a tough city, haunted by his dreams and confused by his past. When his partner is murdered and his colleagues betray him, Canelli must confront his past and question the direction of his life. Kickback is a fast-paced thriller that explores themes of corruption, consciousness, society, and self-respect against a big-city backdrop," says Lloyd. The iPad app (which takes advantage of the new retina screen) presents Kickback in a stunning high-quality digital format, with a specially-designed user interface that gives the reader smooth swiping from page to page, flawless pixel-per-second movement, and effortless transition to Panel Mode to view enlarged panels one by one in beautiful detail. The app also includes an audio commentary by the artist, an exclusive interview, and production notes and sketches. In the exclusive interview Lloyd discusses a range of issues and details his experience of launching the print version of Kickback just after the V for Vendetta movie was released and is scathing about former publisher Dark Horse and their lack of promotion of his work. In relation to the decision to release the work in iPad format, Lloyd commented, "Intelligent graphic novels for adults have rarely been able to find the readership they deserve. With this iPad version of Kickback, we're making something I'm very proud of available to millions of people who wouldn't think of scanning the graphic novel section of a bookstore, or entering a comic shop. The format also allows us to add features that would either not be possible or be too expensive in a printed book. The whole thing looks fantastic and I'm very excited to see my work in this form." 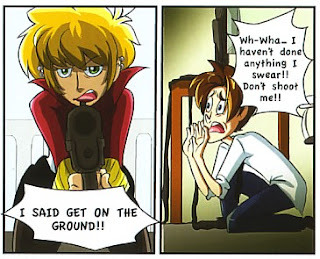 The artist worked with Tokyo-based digital publisher Panel Nine Publishing who specialize in fully-featured software for digital graphic novels. Publisher Russell Willis, a Brit, commented: "Not all digital comics are created equal. The 'lean back' nature of the iPad allows immersion into the material and we have created software which sweats the small stuff to exploit the features of the device and create the optimal reader experience. This is a world away from reading a dodgy PDF on a computer monitor. Kickback is the future of the graphic novel." Kickback is available for all versions of the iPad and can be purchased from iTunes for $9.99. This app presents Kickback in stunning high-quality digital format, with a specially-designed user interface that gives the reader smooth swiping from page to page, flawless pixel-per-second movement, and effortless transition to Panel Mode to view enlarged panels one by one in beautiful detail. Just to prove Commando is read around the world here are four members of the British Services Antarctic Expedition 2012 reading Commando in Antarctica. They are (left to right) Lt Col Pete Davis, Surg Lt Simon Hornby RN, Major Justin 'Jez' Stemp Royal Marines, Lt Cdr Paul Hart RN. 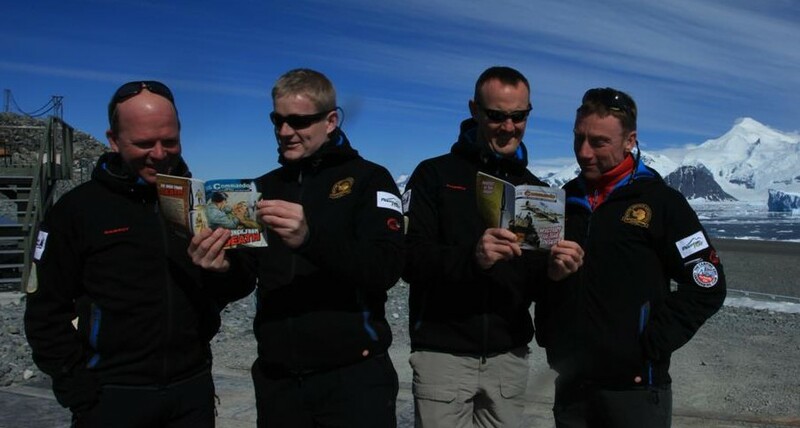 DC Thomson were one of the sponsors of the expedition and, as can be seen, supplied the team with Commando comics to keep them entertained. We are pleased to say that the expedition successfully achieved its objectives and returned safely. 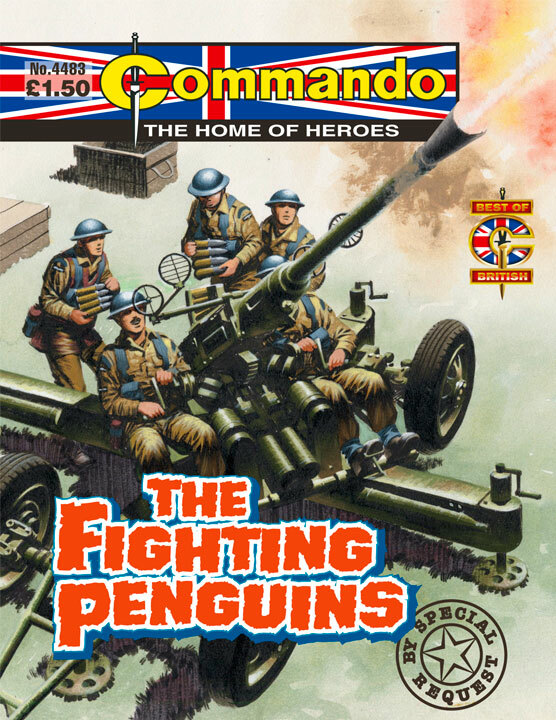 Looking at this photo it seems somehow appropriate that two of the Commandos in the current batch are entitled War In The Snow and The Fighting Penguins. The writer and artist Craig Daley gives us a story that deals with the fictional, but gruesome murder of three security guards in Meadowhall, two months prior to the opening. The bizarre murders take place on the night of the Summer Solstice in 1990 and D.C.I Bramley of the Met is called in to deal with the triple homicide. The fast paced investigation that follows leads the Police into areas they had not expected and ends with several shocking and surreal discoveries. The digital format allows the reader the opportunity to zoom in and analyse each page for clues and carry out their own investigation. Craig Daley worked for a few years on the comic strip The Jerks for the national magazine Making Music, but tells us Meadowhell is a return to his roots as a born and bred Sheffield lad who prefers creating comics in a longer comic book format. “It’s Hammer Horror meets Silent Witness with a bit of Richard Dawkins to confuse matters, he says. 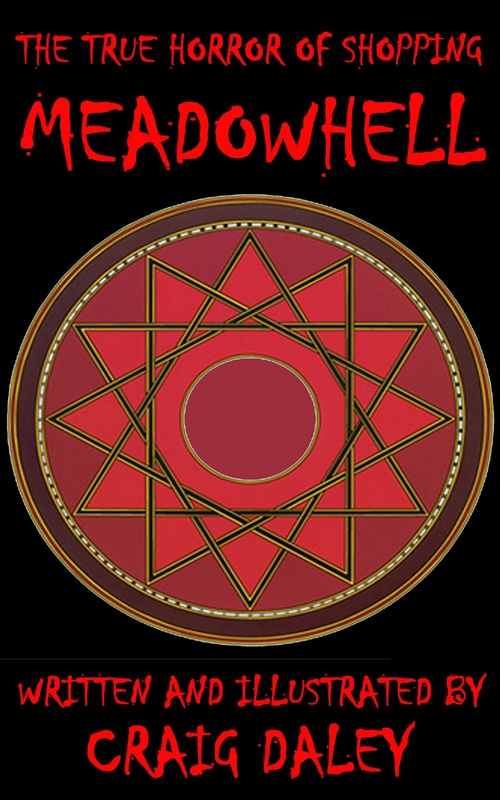 As well as beng on sale online CD Comics Meadowhell and their other titles are available at three Sheffield retailers: the Wicker’s Sheffield Space Centre, Broomhill’s Galaxy 4 and Rare and Racy on Devonshire Green, for £2.50. Other titles currently available locally and on Kindle include Spring Heeled Jack, Football Crazy, Manhattan 1930 and War Nurse, the latter a reinvention of a public domain heroine created in the 1940s. 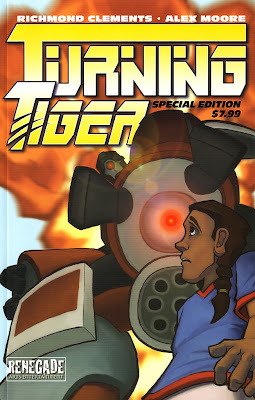 Written by an Ulster man living in Scotland, drawn by an English woman, published by a Canadian company and set in small town America, Turning Tiger is quite the international collaboration. 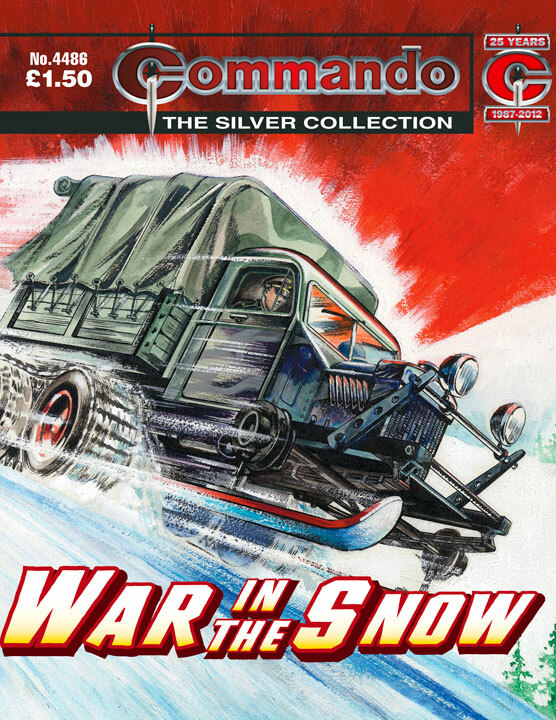 Originally published as a two issue mini-series, it has now been collected into a Special Edition and bolstered with a selection of extras. Three fighting robots have been created for the US military which their scientist creator thinks of as her children but the general in charge of the project thinks of as tools. During their first, initially successful, live weapons test, one of the robots, JEN, stops and then flies away from the test range and abducts Sarah, a young girl who has just survived a car accident. Having been taken into the woods by the robot, Sarah discovers that JEN wants to play with her. Writer Richmond Clements takes a concept that could so easily have been just a big robot story and gives it a tweak that turns it into something much more. 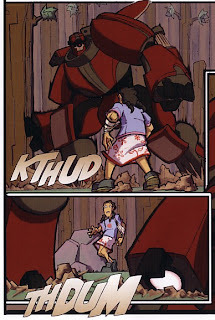 The concept of how the robot and child react to, and then interact with, each other becomes the core of the story leaving the reader with a touching if somewhat unusual story of sibling love. While it feels short for an American style offering, if this had have been presented as a European style book then it would probably be just the right length. Alex Moore's slightly stylised artwork works well with both the robots and the characters while her character designs page at the end of the book shows just how far the robots came from her original design concept for them. The selection of pin-ups at the end of the book gives her the chance to have a little fun with the characters and if anything I prefer the tongue-in-cheek illustration of the robot playing softball with Sarah using a tree stump as a bat to the one that was used on the front cover. Richmond Clements is a familiar name in the small press comics scene in the UK and is well known for writing for and editing a number of titles, including the A4 anthology Futurequake and the A5 2000AD zine Zarjaz, as well as organising the Hi-Ex comics convention in Inverness with Vicky Stonebridge. Alex Moore on the other hand is relatively new to comics having previously worked as a story board artist but, based on this offering, I would be interested to see more of her work and she is currently working on The Liberty graphic novel written by GM Jordan for Markosia. 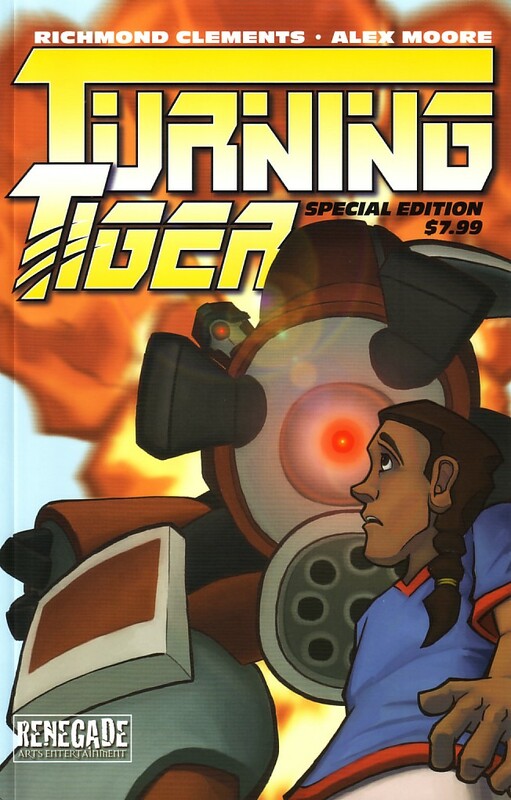 Turning Tiger is a story that could so easily have been a Transformers movie style shoot-em-up but overcomes all initial assumptions to be a nicely touching character piece. There are more details of Turning Tiger on the Renegade Arts Entertainment website including details of how to purchase e-copies. There are more details of Richmond Clements' work on his blog. There are more details of Alex Moore's work on her website. Richmond Clements, Alex Moore and Renegade Arts Entertainment will be attending the Hi-Ex comic convention in Inverness this weekend, Saturday 31 March and Sunday 1 April 2012. Good news at last from Print Media Productions. STRIP Magazine #4 has finally arrived in the UK and will be on sale in British comic shops next week. 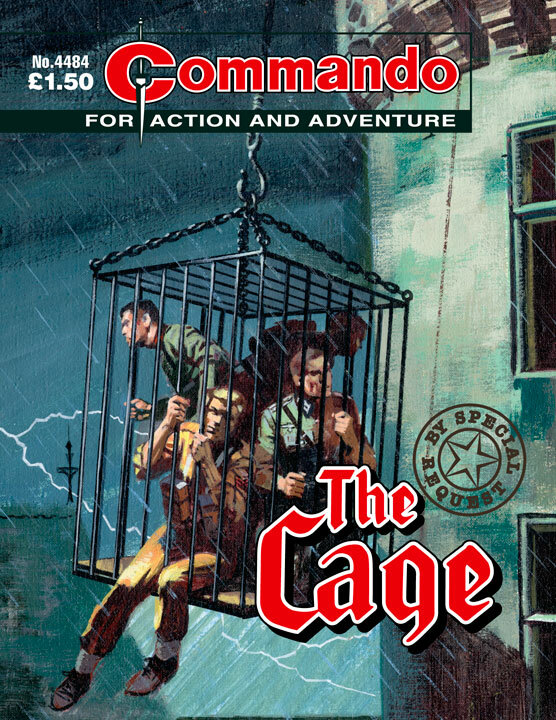 In the latest edition of the all-ages adventure anthology comic, which features a cracking cover by John McCrea, the Black Ops Extreme military squad are sent on a mission to destroy a nuclear power station in the Middle East (story by John Freeman and PJ Holden; there's the start of a new Age of Heroes tale by James Hudnall and John Ridgway; the war between gods hots up in Warpaint by Phil Hester and John McCrea; Nazis hunt for access to a dangerous power in pre-war France in The Devil's Heritage by Jerome Felix and Paul Gastine; a diver finds out even baby sharks can be deadly in Hook Jaw, re-mastered by Jim Campbell; and science goes mad and bad in the Strip Challenge story "Slayer Keith" by David Hailwood, Stu Smith and Dave Thomson! The issue also includes interviews with Devil's Heritage creators Jerome Felix and Paul Gastine and Andrew Wildman, best known for his work on Transformers. PMP has also announced that they are making Issue 5 of their first volume a double issue (so there will now be no #6 Volume 1) to close some storylines and clear the decks for the new line-up in #1 Volume 2, their first news stand issue, on sale at the end of May. PMP say this double issue will only count as a single issue as far as subscribers are concerned to thank them for their loyalty. 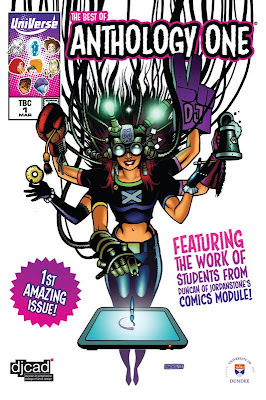 Anthology One is the first publication to come from the new UniVerse imprint set up as part of the various comics related courses run by the University of Dundee. Co-edited by Dr Chris Murray of the university's School of Humanities and Phillip Vaughan of the university's Duncan of Jordanstone College of Art and Design (DJCAD), it presents the work of the students of the 2011-2012 DJCAD Comics Art and Graphic Novels module as well as the winner and runners-up of the 2011 Tartan Bucket Prize that was run as part of last year's Dundee Comics Day. A 72 page, US comic size book with an excellent cover by DJCAD graduate Colin MacNeil, Anthology One does exactly what is says on the tin and presents a series of short stories from each of the contributors: Nest by Stephanie Scott; Hubert and Remington by Charlie Parsons; Treasure Hunt by Rebecca Rolland; Mob Mentality by Calum Sutherland; Asylum by Louise Cadger; Code of Love by Samantha-Jo Ross; Subject Nine by Claire Roe; and finally Calvin The Dog by Jamie Buchanan. The Tartan Bucket Prize section at the back features the winning strip, Belle's Magic Mobile by Stephen English, that was also published in The Beano, plus the four runners-up, The Ape Prentice by Stephen Baskerville, Holly Unlikely by Adam Smith, Elly's Evil Teddy by Jamie Huxtable and Jack The Robot by Paul Rainey. Any anthology title can be a hit or miss experience depending on the reader's interest but it has to be said that the standard achieved throughout the book by the DJCAD students is uniformly high. Their strips range from complete short stories to issue zero style intros to what could become a longer story and each strip also has a page or two of design sketches. Since I enjoy 'police procedural' TV series Samantha-Jo Ross' different take on the arrest of a suspect in Code of Love (left) is perhaps the highlight for me, helped by being complete in itself, but Stephanie Scott's moodily talky Nest and Jamie Buchanan's silently comedic Calvin the Dog, despite being worlds apart both story and art-wise, are also both interesting while Hubert and Remington by Charlie Parsons with its robot and human lead characters is perhaps the most 2000AD or Megazine-like strip in the collection. It would have been nice to read a paragraph or two by the creators explaining their work as part of their sketchbook pages but that is a minor gripe. With the main section of the book being the DJCAD students producing artwork formatted for US size publication, the Tartan Bucket Prize pages formatted for DC Thomson's Beano and Dandy are a considerable change of pace. The introduction at the very beginning of the book by Chris Murray gives a little of the background to the competition but it would have been nice to read more details on the competition and its creators while a separate introduction to this section would have lessened the culture shock between the two different sections of the book. 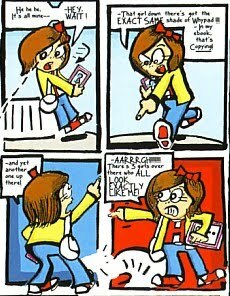 Of these stories Adam Smith's Holly Unlikely (right) is perhaps the most interesting with its girl character puzzled by being able to see herself in other panels on the same page, although it is also probably the least likely of the Tartan Bucket strips to work as a series. Anthology One is an interesting snapshot of the comics work that has been gradually building up over the last five years or so at the University of Dundee and shows off a wide range of styles and genres. It will be interesting to see if Anthology Two, which is scheduled to contain work by the students of the MLitt in Comics Studies, can keep up the high standard of this first issue. Anthology One will be formally launched and available to buy at the Hi-Ex Comics Convention in Inverness this weekend, Saturday 31 March and Sunday 1 April 2012. The cover price is £5.95. Anthology co-editors Dr Chris Murray and Phillip Vaughan are interviewed on downthetubes here and here. Over the last few years downthetubes contributor Jeremy Briggs has collated a Scottish Comics Events Review Of The Year. The first two years reviews were published in the Hi-Ex convention brochures with the Hi-Ex 2 brochure covering those events in 2008 and the Hi-Ex 3 brochure covering those events in 2009. With the postponement of Hi-Ex in 2011 the home of the reviews moved, with the blessing of the Hi-Ex organisers, to the downthetubes main site where the 2010 review was published for the first time and the previous two reviews were reprinted. As the reviews were originally so closely tied to the Hi-Ex convention, Jeremy has held back publication of the 2011 review this year to allow it to once again tie in with the Hi-Ex convention that is taking place this weekend, Saturday 31 March and Sunday 1 April 2012. Jeremy will be attending the convention on both Saturday and Sunday while downthetubes editor John Freeman will be there on the Saturday. You can read the Scottish Comics Events Review Of The Year for 2011 here. There are more details of the Hi-Ex Comics Convention on their website. Issue 26 of the Dan Dare-inspired Spaceship Away is now at the printers and will soon be winging its way to subscribers and stockists. Along with the regular strips the issue features three new Don Harley paintings, including a fabulous centre-spread of Frank Hampson working away in his studio under the watchful eye of Dan and the Mekon. There are also three articles focusing on the audio versions of Dan Dare - Phil Harbottle and Penny Fabb review Dan Dare on Radio Luxembourg; Rod Barzilay hears from cast and crew of the 1990 BBC Dan Dare radio drama; and John Freeman tells us about the "Dan Dare Pilot That Never Flew", along with comments by actor Colin Baker. Jeremy Briggs interviews Tom Kelly about his Dan Dare Musical that premiered nine years ago and there is some interesting feedback on previous issues in Chat-Back (which includes the late Bruce Cornwell's last ever sketch). "Models from Dan Dare's World" also offers readers a look at Sid Clark's Treen "Green Magnet" fighter. 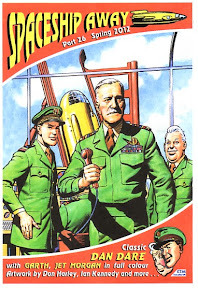 There is also the second and final part of the "Pre-Emptive Strike" Dan Dare adventure by John Freeman & Mike Nicoll, plus an Eric Eden painting in Readers' Corner, along with some details from "The Horlicks Spaceman's Handbook" relating to the Radio Luxembourg article. Finally, Tim Booth's oil painting of Professor Peabody adorns the back cover. Spaceship Away is available at selected British comics shops and directly from theSpaceship Away website. The cover price for the 2012 issues is £7.95 each which includes UK postage if ordering from the website. An annual subscription for the three issues is £21.50 for UK residents and non-UK subscriptions are available from the website. Eagle Times, the quarterly journal of the Eagle Society, has reached its twenty-fifth year of publication. 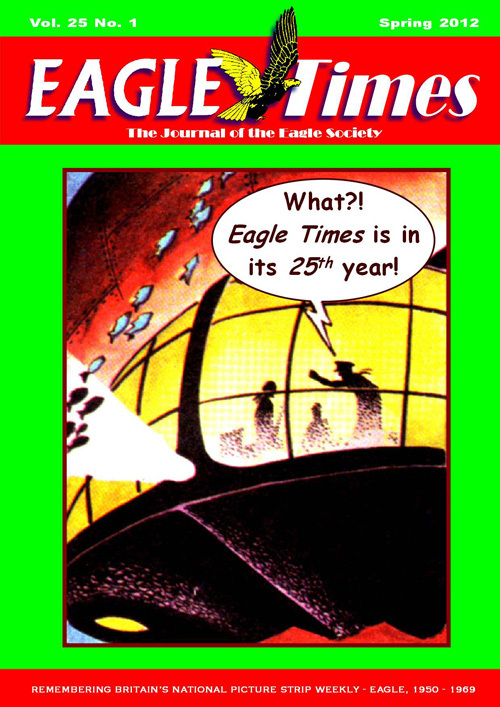 By far the longest running British comics fanzine, Eagle Times has now been published some six years longer than the weekly comic that it celebrates, the original Eagle which ran from 1950 to 1969. 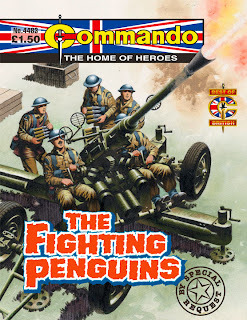 The current issue of the 56 page A4, B&W and colour fanzine is Volume 25 Number 1 and includes features on Luck of the Legion, the French Foreign Legion strip by writer Geoffrey Bond and artist Martin Aitchison that ran in Eagle from 1952 to 1961, the Dan Dare story from 1958, The Ship That Lived, about Dan's spaceship Anastasia, and the air pirate tale Sky Buccaneers written by Edward Cowan and drawn by José Ortiz which appeared ten years later. In addition there are articles on the connection between artist Roger Dean and Eagle, the 1930s and late 1960s work of Eagle's main cutaway artist L Ashwell Wood, and colour photo features on the 1980 Eaglecon convention and Dan Dare toy figures from the 1950s to the modern day. downthetubes contributors Richard Sheaf and Jeremy Briggs provide features on the exhibition celebrating the work of John Ryan, artist of Eagle's Captain Pugwash and Harris Tweed, as well as the Eagle cutaways of the Dan Dare artist Bruce Cornwell who passed away as the issue was at the printers. Our congratulations go out to Eagle Times editor Howard Corn and his production team of Tony Crowley, David Gould, Will Grenham, Keith Howard, Nigel McMurray and Adrian Perkins on reaching their silver anniversary. 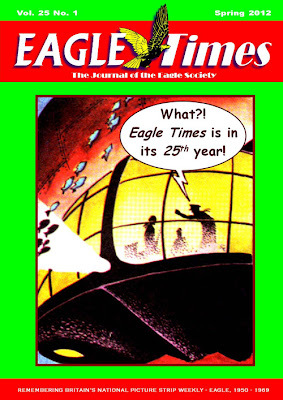 Eagle Times is published four times annually and is available via membership of The Eagle Society. The subscription rate for 2012 is: UK £27, Overseas £38 (in Pounds Sterling). Postal applications to: Keith Howard, 25A Station Road, Harrow, Middlesex HA1 2UA, United Kingdom. More details of both the magazine and the society are available on the Eagle Times blog. Phillip Vaughan is a lecturer at the University of Dundee's Duncan of Jordanstone College of Art And Design (DJCAD) with a background in 3D animation for the television, film and games industry. 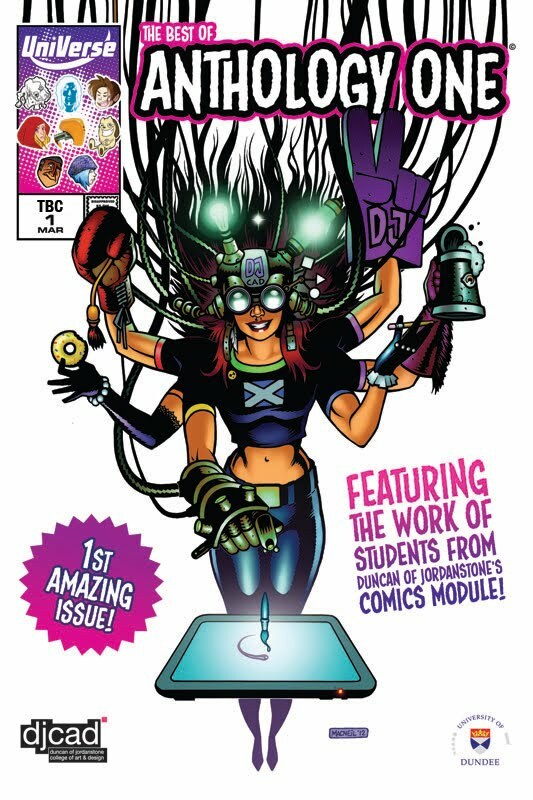 At DJCAD he teaches graphic design and has run the first module on Comic Art and Graphic Novels, the results of which have just been published in the Anthology One book from the new UniVerse imprint. Jeremy Briggs talks to Phillip about his work teaching the new generation of animators and graphic artists. 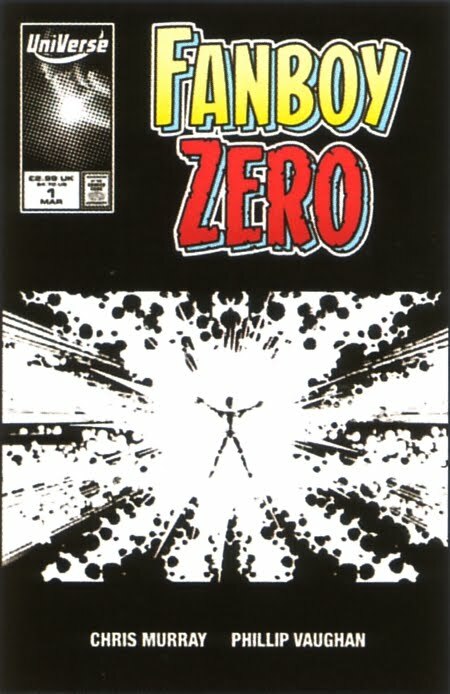 What comics did you grow up reading and what do you read now? Being brought up near Dundee, it was inevitable that my first comics were The Beano and The Dandy. 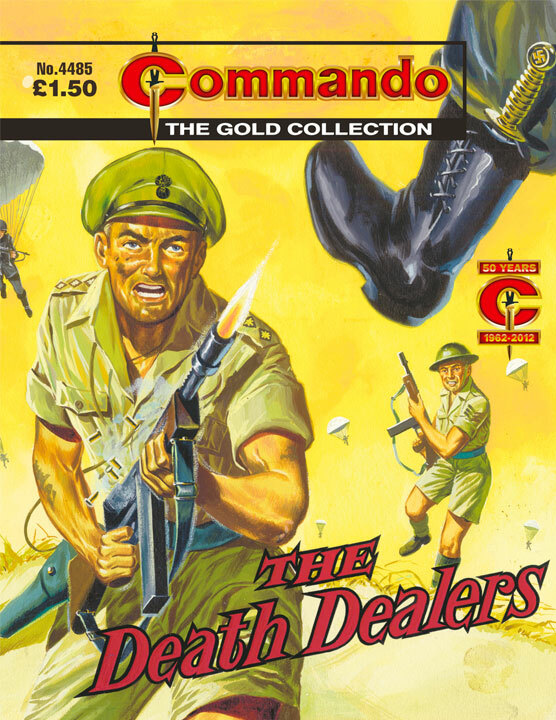 I soon graduated to more 'adult' comics such as The Victor, Warlord, Commando, Starblazer, Spike, Buddy and Champ, all DC Thomson stalwarts. In 1982 I picked up the new Eagle, but wasn’t impressed with the photo strips (bar Doomlord! ), really I bought it for Dan Dare, especially the early Ian Kennedy run. A slow adopter, I moved onto 2000AD in 1984. Also around this time I discovered Marvel and DC Comics imports in my local newsagents. Sporadic though these imports were, I managed to collect runs of Uncanny X-Men, Peter David's run on the Hulk, John Byrne's run on Superman and some of Alan Moore's stint on Swamp Thing. These days, I have stuck with 2000AD through thick and thin, and like the sentiment of anthologies such as Strip and Clint. I dip my toes into the American mainstream now and then, currently reading Hellblazer, Fatale, Action Comics and Captain America (mainly for the Alan Davis art). I have also been picking up Requiem by Pat Mills and Oliver Ledroit. You lecture at DJCAD, could you tell us a little about what you cover and how comics came to be in the curriculum? For the past 7 years I have lectured part-time in Graphic Design, mostly covering On-Screen and Motion Graphics, and I have also taught 3D Animation. We restructured our courses last summer, and as part of the new Communication Design umbrella, we were invited to pitch new expansive modules. I proposed the Comic Art and Graphic Novels Module, and was happy when this was picked up for Level 3 students to participate in. Dr. Chris Murray, Lecturer & Programme Convenor at the School of Humanities (left, with Phillip Vaughan, centre, and Cam Kennedy, right), was a great help in the preparation of this module, as he had undergone the same process in the School of Humanities a couple of years before. The first cohort of students signed up for the module last year, and we are expanding to offer the module to other undergraduate areas of the art college next year. You have had a number of comics creators give talks to the pupils as part of the course - who has done this and do the students value these talks? So far we have been very lucky to welcome David Bishop, Colin MacNeil (a DJCAD graduate and cover artist of Anthology One), Frank Quitely, Cam Kennedy and the guys from DC Thomson, Calum Laird, George Low and a childhood favourite of mine, Ian Kennedy! Phew! This year, as well as returning guests, I have a few more very special creators up my sleeve, who have agreed to come in and impart their considerable knowledge! The students have given very positive feedback, and I can't wait to reveal who we have coming this year! How did you get involved with the Dundee Comics Day? Dr. Chris asked me! No seriously, me and Chris had been having several planning meetings with regard to my module and Chris's Comic Studies MLitt in Humanities. 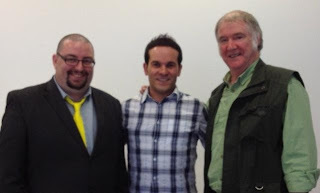 We dreamed up a wish list, that just so happened to include a lot of 2000AD alumni and I had a few contacts, Chris had his contacts and we managed to get a stellar line up of guests for Dundee Comics Day 2012. Again we are looking to push the boundaries for this year’s Comics Day…stay tuned! How did Anthology come about and is it something that we can expect from each year of the course? The Anthology was always part of the brief for the DJCAD Comic Art and Graphic Novels module, where the students were asked to produce between 2-6 finished pages of comic art, on a subject of their choice, for publication. The final book, Anthology One, features the best of the work from the module, and runs to 72 pages of full colour artwork. 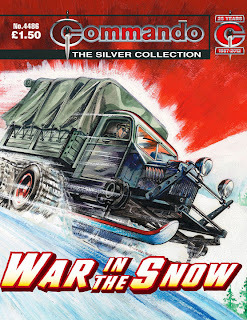 Colin MacNeil has provided a stunning cover for the first issue. The book costs £5.95 and is non-profit, with costs just covering printing, and it will be used to support and promote the students hard work! We will be launching the book at Hi-Ex on the 31st March. Everyone who has seen the finished product has been very impressed with the work, which was produced in a very short space of time. Anthology Two will feature the work of students from the Comic Studies MLitt, and then we will keep the book running as a biannual affair! These publications will all be published under the UniVerse imprint which we have recently set up. Could you tell us a little about your work outside of the university? When I am not teaching, I work as a freelance designer/animator. Over the last 16 years I have worked on many different projects including 3D animated sequences for Deathtrap Dungeon, Star Trek, Farscape, Tom & Jerry, Wallace & Gromit, Teletubbies(! ), Braveheart, plus a couple of original computer game concepts for various publishers such as Eidos and Sony. Most recently I completed the character design, animation and front end work on an iOS Superman Game App for DC Comics/ Warner Bros, which was nice! In the little spare time that I have I produce comic work just for fun and have had a couple of strips in Zarjaz, with the next one appearing in issue 15, out in July. The next project on the table is a comic book collaboration with Dr. Chris Murray. There is more information about Duncan of Jordanstone College of Art & Design on their website. 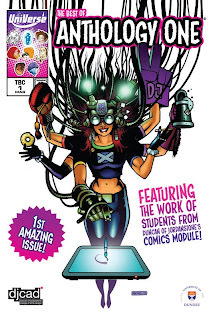 There is more information about the University Of Dundee's MLitt in Comics Studies on the university website. There are more details of Phillip Vaughan’s freelance work on his website, V14 Studios. Phillip Vaugan will be at the Hi-Ex Comics Convention in Inverness on Saturday 31 March and Sunday 1 April 2012 where he will have copies of Anthology One for sale.